Editor’s note: Chester Ng is co-founder and CMO of SweetLabs, makers of Pokki, a modern app platform for the PC. Follow him on Twitter @chest. Over the past couple of weeks, we’ve been blessed by the prescient researchers at Gartner and IDC with fresh data and predictions about the shipment trends for smart devices, especially the PC. This has sparked the typical “PC is dead,” “PC is really dead,” and “PC is really, really dead” mass burial blog posts around the world. A. PC shipments worldwide are decreasing. B. Mobile phone and tablet shipments worldwide are increasing. C. The reception to Windows 8 has been weak. The general consensus is that B and C are causing A, and, therefore, RIP, PC. In fact, IDC even explicitly threw Windows 8 under the bus, stating the new OS has “not only failed to provide a positive boost to the PC market, but appears to have slowed the market.” The misinterpretation from the herd is that because people don’t like Windows 8, they are purchasing mobile phones and tablets to replace PCs as their primary computing device. Now, I haven’t been one to shy away from pointing out Windows 8’s challenges, but a key trend is missing from this simple causality equation and blame game: PC replacement cycles have slowed. The fact is your 4-6 year old PC (or Mac) hardware is good enough. That’s not Windows 8’s fault nor is it your phone’s fault. The PC form factor matured over the past decade with the power, speed and performance good enough for mainstream users. Another missing piece to this logic is the continued prevalence of the PC as the primary computing device for a lot of people. In fact, the experts would have you believe that declining new PC shipments means that PCs are being thrown out the window, as people scream obscenities at Windows 8 and make love to their new phone or tablet. People will buy and use the device that best suits their needs, but the PC is far from obsolete. The reality is that the “post-PC world” is one in which the PC form factor no longer reigns as the only smart device in your connected life and has to share the spotlight with the mobile phone, tablet and TV. People will buy and use the device that best suits their needs, but the PC is far from obsolete. There are somewhere between 1.5 billion and 1.7 billion people (depending on who you believe) who have not buried their PC and 92 percent of them are on Windows (the other 8 percent live in Silicon Valley with no clue about what the other 92 percent are using). Lots of time is being spent on that “dead” PC form factor. More than 70 percent of all hours spent on computing devices (PCs, smartphones, and tablets) are on a PC. More than 80 percent of Internet traffic comes from PCs. For 74 percent of people, the PC is the device used most frequently to access the Internet. PC shipments are down and will probably continue to fall, but in the meantime, existing PCs are actually alive and living longer than ever before. 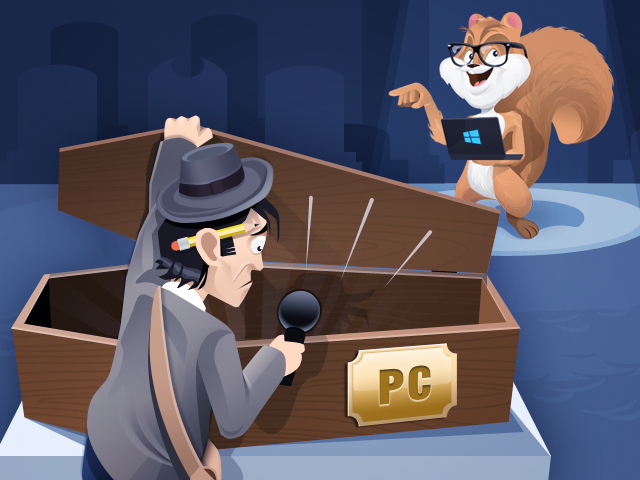 So while we all type (on a PC form factor, ironically) heartfelt eulogies for our beloved PC, let’s take a moment of silence to remember that the PC (and even Windows) is still very much alive.